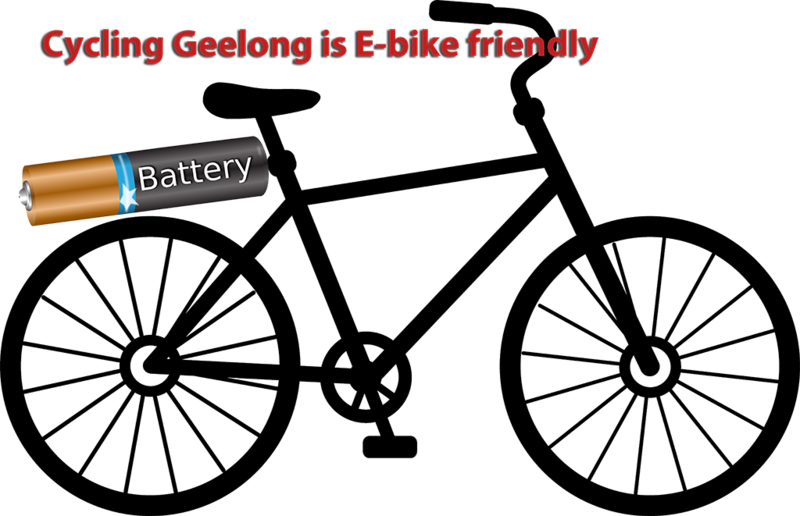 Combined DIRT Ride with Cycling Geelong and the GTC from Torquay to Anglesea on Sunday 14.4.19. We had a group of 13 riders this week. First up we had a surprise Christmas present of a mini dustpan and brush for Geoff from David & Linda. 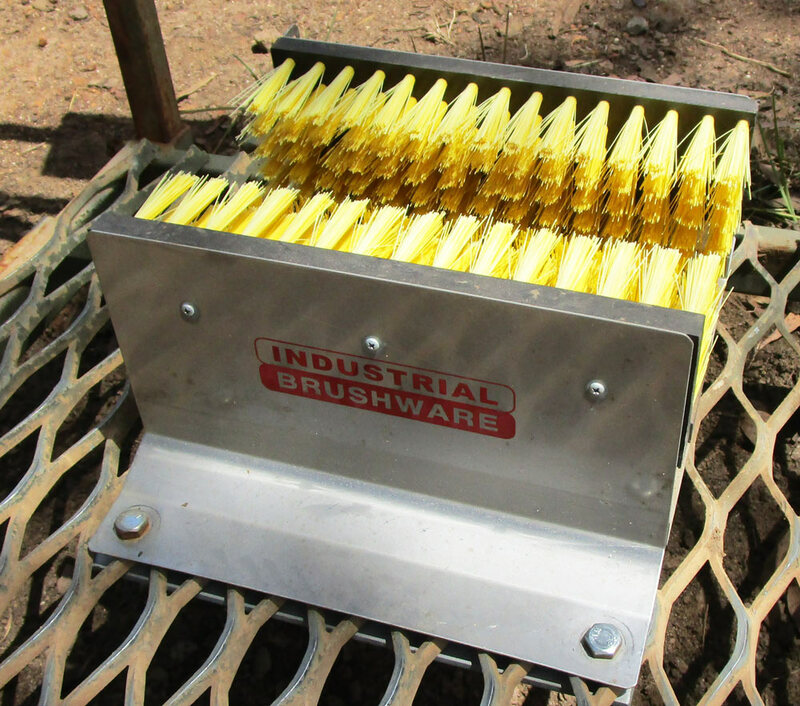 This was put to good use a few minutes later when we stopped several times to clear some broken glass from the trail. Track cleared we headed for Drysdale. Linda had a puncture as we got to Leopold so the group split into two. At our coffee stop at Cafe Zoo we were wished a Merry Christmas by Mark, Julie and the team and thanked for our patronage over the past year. Thanks everyone for making the regular Thursday club ride such a success! I arrived at Sth Barwon Reserve expecting that no riders would turn up as the weather forecast didn’t look too promising. But I was surprised to see Hermann waiting in his car. We were discussing whether to abandon the planned ride and go home when David Fisher arrived on his bike so we decided to ride after all. 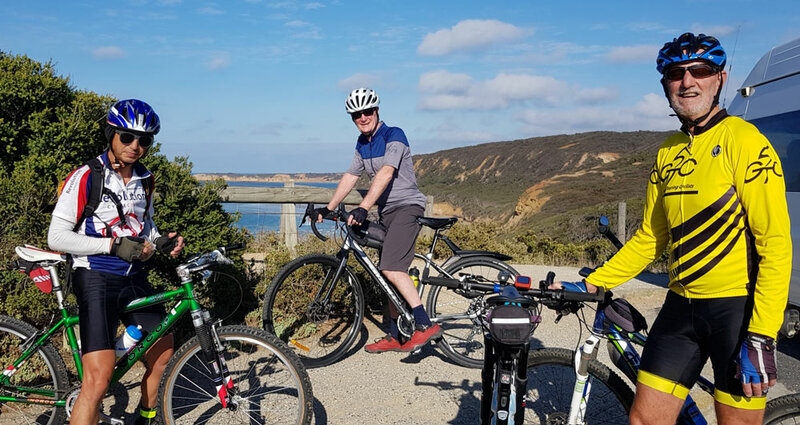 I was impressed that Hermann kept up a good pace on his trusty ebike, as I had only ever seen him riding on the Barwon Trail or the Bellarine Rail Trail, and we managed around a 20km/hr average on the ride down Barwon Heads Rd, Lake Rd and 13th Beach Rd to our coffee stop at Garage in Ocean Grove. After a nice coffee break we headed home via Wallington Rd and Bellarine Hwy. Just as we turned into Bellarine Hwy there a loud bang (I thought it was a gunshot 🙂 and we saw that Hermann had stopped. When we checked we saw that he had a major blowout in the rear tyre. There was no chance of a roadside repair so we decided that I would ride home (just a few km away), get my car and come back for Hermann and his bike. David waited with him and until I returned with the car (thanks for waiting, David) and soon we had the bike in the back of the car and were heading back to Sth Barwon Reserve. Not the planned end to the ride but all was well anyway. Thanks Hermann and David for an enjoyable and memorable day! This was a joint ride with our friends from the GTC. Ross Glover from the GTC has produced a great ride report and I have copied it below, Thanks Ross! 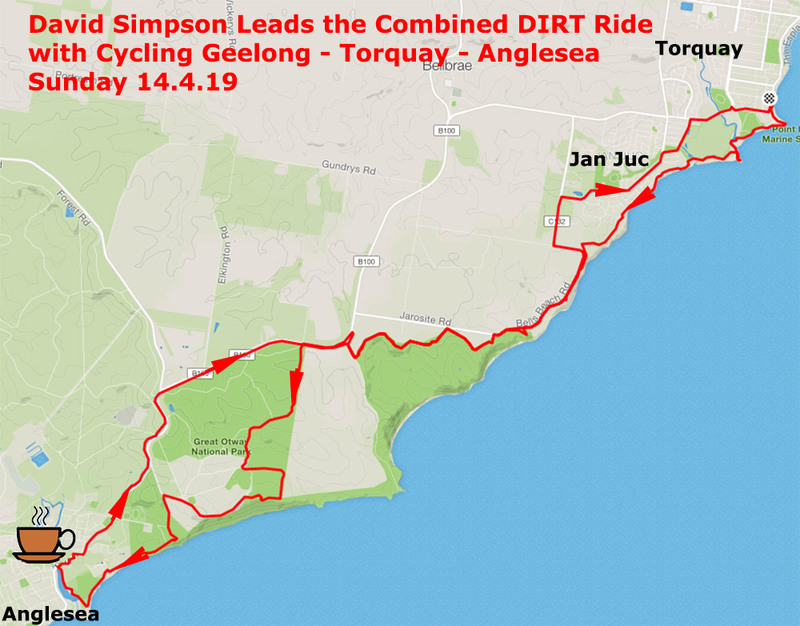 Just 5 riders for todays´ combined dirt ride to Anglesea – Dave the ride leader and Kevin from CG, Chris Hu and Ross from GTC and John M representing both clubs. The 40 km ride was advertised as 75 km on the GTC web site and that may have discouraged some potential participants. 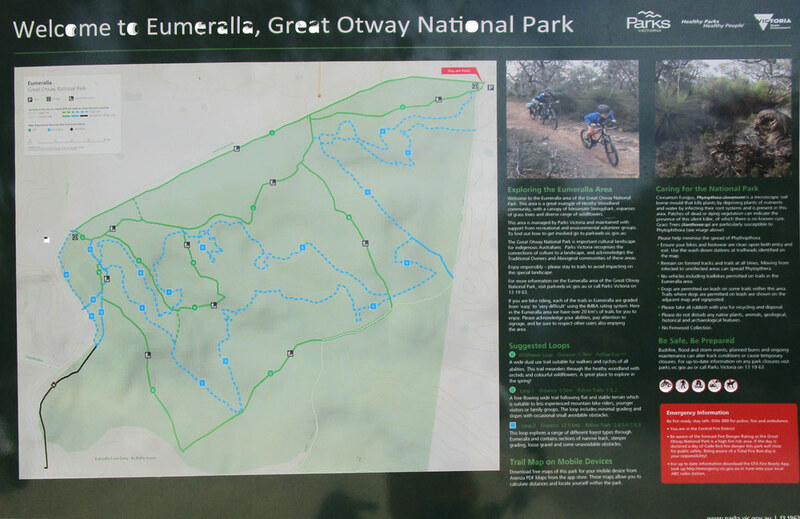 Also had an interesting range of bikes – one modern mtb, one classic mtb, one gravel grinder, one hybrid and one frankenbike – and all coped well with the varied riding surfaces. As always, an enjoyable ride through the bush between Torquay and Angelsea. Nothing difficult but lots of great vistas and plenty of undulation. 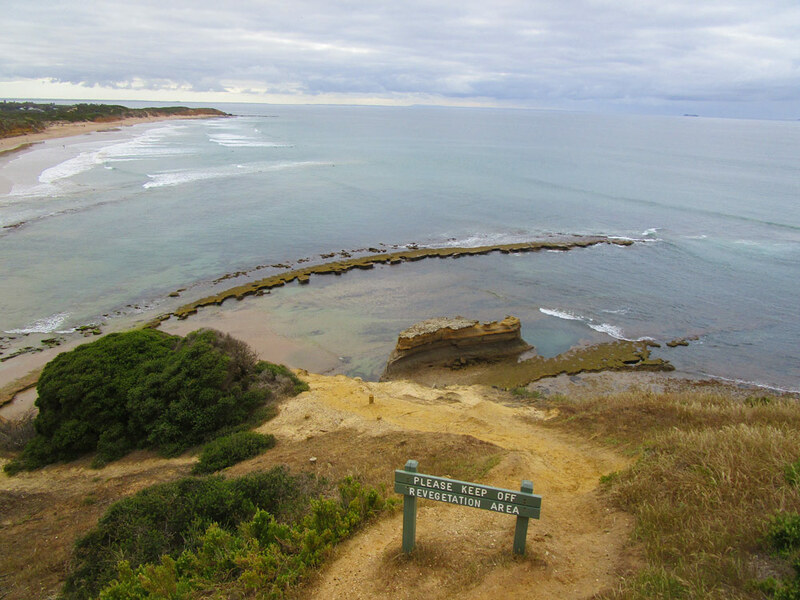 Nothing much to report other than a mixup on the return trip where 3 of us waited at Bells Beach for the other 2, only to eventually discover they had ridden past without seeing us. A very pleasant place to waste some time watching the surfers perform down below. Thanks to Dave and the crew for a most enjoyable outing. Ross. We had 8 riders at the start point at Sth Barwon reserve. 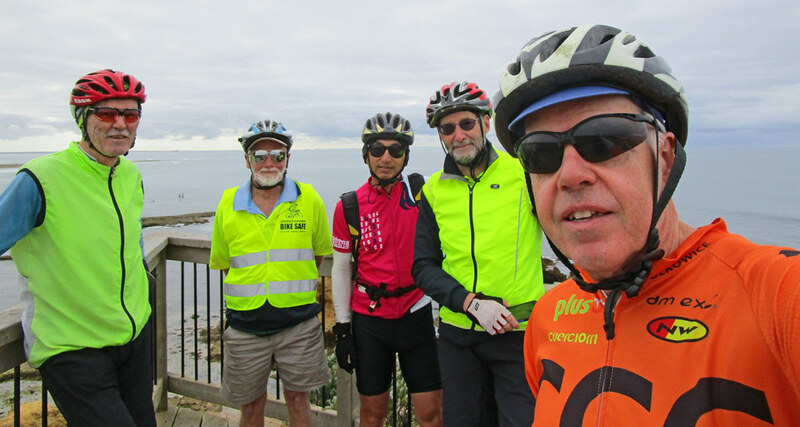 As it was a strong Northerly wind I initially thought about doing the ride in the reverse direction, to get a tail wind on the Highton Pipeline path, but Lynton had to get back early so we set off in the planned direction, heading to Waurn Ponds first. It was a good day for riding, no rain. When we got to Deakin I led the group around the gravel loop and we stopped for a picture by the lake on the western boundary of the campus (picture kindly taken by Tim who was out walking his dog). We then continued on for a quick tour through the middle of the campus, with ‘tour guides’ Lynton and David S who told us about the roles of the various buildings. Heading off after a short ‘pitstop’ we made our way into the headwind along Pigdons Rd and then along the Highton Pipeline bike path, then down Roslyn Rd to a coffee stop at Two Sugars where we found a nice table in the sun. After coffee we rode along the river path, stopping to watch a Dragon Boat race, back to Sth Barwon Reserve. A great ride, thanks everyone. 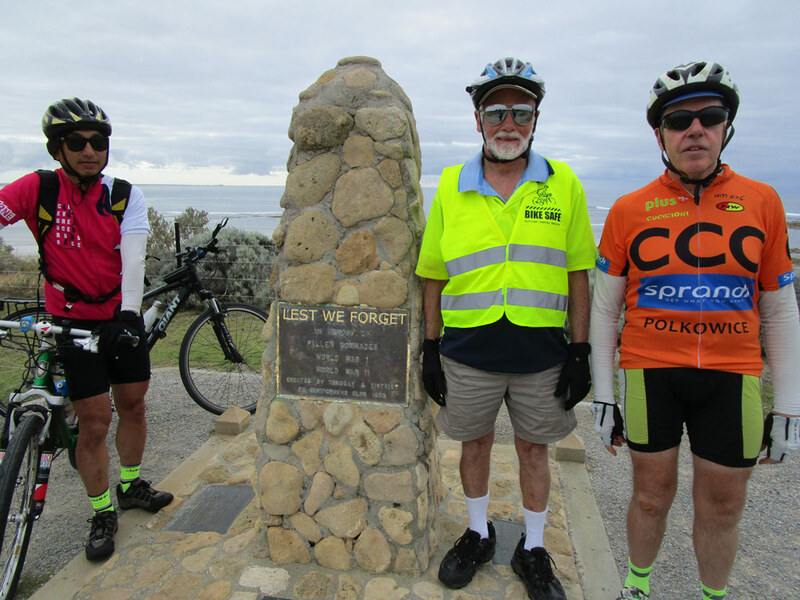 We had 3 riders, Dave S, Lynton and Colleen, at the designated start point at Rippleside. It looked like a great day for riding, with no wind at the start and predicted North wind later, which would help us get home. We met Coralie on the road at Corio Quay where we saw that some gigantic wind turbine blades were being unloaded. 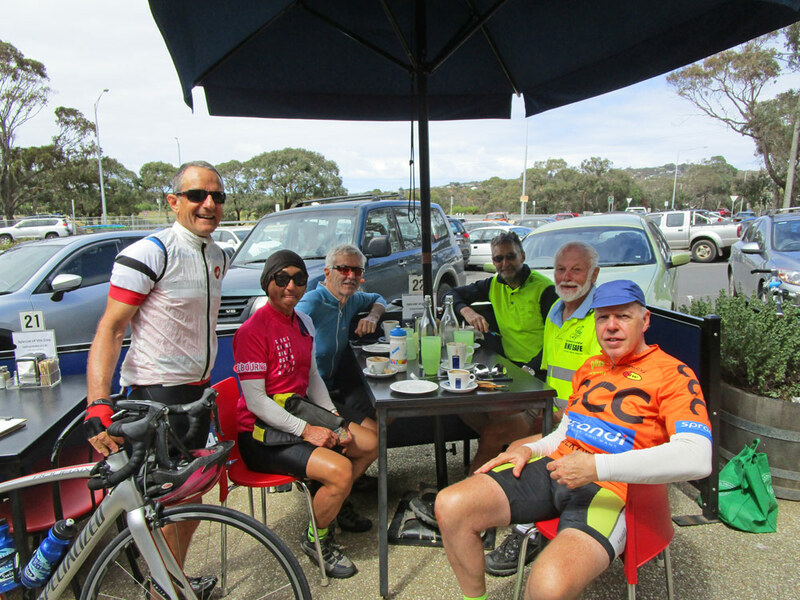 After a quick pitstop at Coralie’s house to add some pressure to the rear tyre on her Bike Friday we continued around the Esplanade and then the Bay and Hovell’s Creek trails to stop for coffee at Espresso Blu, Lara. On the way back Coralie offered to show us the roads around the Hovell Park area which were new to me and we then retraced our route back to Rippleside, taking advantage of the tail wind.